Yesterday's warmer temperatures made me think about Summerfest 2012 and how excited I am to ride the Glider and listen to some awesome bands this summer. Speaking of awesome bands, how about this year's Marcus Amphitheater headliners? There are still several dates that have not yet been announced, but there is certainly something for everyone in this year's Marcus Amphitheater Summerfest lineup. I'd like to see Neil Diamond, just because he's so iconic in the pop world. I'll admit, I do like belting out "Sweet Caroline" whenever the song comes on. I've also heard good things about the Zac Brown band, so I'll probably make it a point to see them. And because I'm such a nice relative, I'm thinking about taking my dad to see the Beach Boys and my nieces to Big Time Rush. 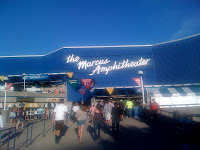 Time to get my Marcus Amphitheater tickets. Now, another question I often consider is "where should I sit at the Marcus Amphitheater?" Over the years, I've pretty much sat in every possible seat that you could possibly think of at the Marcus Amphitheater. To be honest, I have enjoyed sitting in the lawn seats. I've also enjoyed sitting in the third row from the stage. For me, it all depends on who I'm attending the concert with and how big of fans of the band we are. I like a good outdoor concert, so sometimes I'll buy lawn seats just to hear good live music, regardless of who's playing that particular night. Once I bought Marcus Amphitheater tickets because I got caught in a rainstorm and I opted to sit in the yellow section so that I could be under the cover. Last summer, my favorite band headlined the Marcus Amphitheater so I splurged and got third row seats. There is not a bad seat in the house, it's just a matter of how close you want to be to the band. You can't go wrong! There are still five slots remaining to be filled for the Marcus Amphitheater Summerfest lineup. Who would you like to see added?